When taking prescription drugs for an illness or injury, it is extremely important to understand the directions provided by a doctor or pharmacist. The more a patient knows about their medication and how to properly take it, the better chances they will have of getting positive results and avoiding or minimizing the instances of adverse side effects. Here are some general guidelines to interrupting the Top 10 most important prescription drug label directions you may come across. Prescription drug labels will tell patients how often they should take their medication. The number of doses suggested is meant to be consumed within a 24 hour period of time. 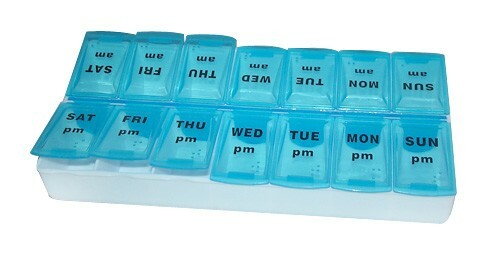 If a medication calls for a dose twice a day, this typically means every 12 hours. Patients could take the medication at 6:00AM and 6:00PM. A prescription that calls for a medication to be taken three times a day will equate to taking one dose every eight hours. The phrase “taken at bedtime” typically means it should be taken 30 minutes to an hour before the patient goes to bed for the night. Prescription drug labels are small, so in order for doctors to convey how a medication should be taken in such a small space, they often use abbreviations. Some commonly confused medication abbreviations are “ad lib”, which means that the medication should be taken freely and as needed and “prn” which also means the medication can be taken as needed. The abbreviation “int” means that the medication should be taken between meals, while “hs” will tell the patient that they should take the medication at bedtime. Units of measure that are used on prescription drug labels are often a source of confusion for patients. The term “cc” on a prescription drug label stands for cubic centimeters, and one cc is the equivalent of one milliliter. A teaspoon is made up of five milliliters or five cubic centimeters. In order to accurately measure these medications to ensure that the proper dosage is being taken, patients should use a medicine dropper or a special medicine spoon. When a prescription drug label states that the patient should take the medication with food, it is warning the patient that they should not consume the medication on an empty stomach. It is suggested that the patient should take the medication immediately before, just after, or while they are eating a meal. This is because some medications can cause stomach pain or problems if they are not taken with food. The most common medications that will cause these reactions are antibiotics, narcotic pain relievers, birth control pills, or non-steroidal anti-inflammatory drugs. Many prescription drug labels will advise that the medication should be taken with water. This is especially true for bisphosphonates, which serve as osteoporosis drugs. These medications are best taken with at least eight ounces of water in order to wash down the pill completely and avoid irritation to the esophagus. 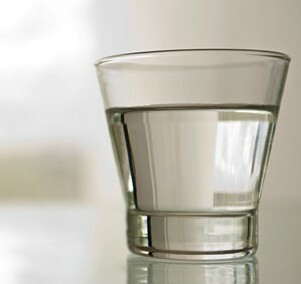 Patients that are taking medications that call for water should not just sip enough water to swallow the pill, as in some cases, a lack of water can also prevent a medication from working properly. The brand name of the drug prescribed to a patient is often displayed on the prescription drug label. Often times there are a number of drug companies that produce the same generic drug but call it their own brand name. The generic name or main ingredient will also be identified. This information is important because different brand names may produce their medications in different dosages, and this could affect the quantity of medications taken per day and other important instructions. Prescription drug labels will also provide directions for properly storing the medication. These instructions are important in order to keep the medication working properly and maintain its original potency. Some medications may call for the drug to be kept in a refrigerator, and most medications will state that it should be kept away from children. If storage guidelines are not included on a prescription drug label, patients should store their medications in a dry area away from both direct light and heat. Medications should not be left in a vehicle for a long period of time, and they should not be left in a bathroom, sink, or near other damp places. 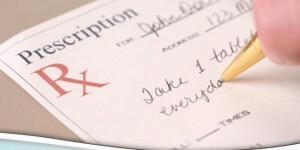 When doctors write prescriptions for patients, they indicate how many refills the patient is allowed. If no refills are available or authorized on the prescription, patients will need to obtain doctor approval before obtaining more of that medication. These refill directions are essential in preventing prescription drug abuse or misuse, and it can also indicate a time frame in which medications must be used in order to prevent negative interactions with other drugs a patient may be prescribed in the future. Drug companies are required to stamp an expiration date on medications, and this date represents that date in which the drug manufacturer can still guarantee the full safety and potency of that medication. After this point, the drug companies will no longer guarantee that the medication is effective. Although this effectiveness of a drug will decrease over time, much of the original potency will remain for years, and placing a medication in a cool environment like a refrigerator will help to keep the medication potent. 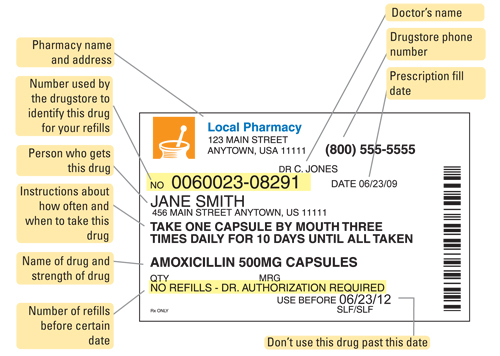 Prescription drug labels also include information about the pharmacy from which the prescription was obtained and the doctor that prescribed it. This information usually includes the pharmacy name, address, store number, and phone number as pictured above. This information can prove to be useful if the patient does not understand a direction on the prescription label. By having this information easily accessible, patients may avoid improper usage and adverse reactions that come from taking prescription drugs incorrectly. By not following the directions of prescription medication labels, patients run the risk of having adverse reactions and will not gain the full intended benefit of the drug. As smart medical consumers, it is important to read and fully understand these directions before taking a medication. If there are ever questions about how to properly take a medication, patients should be sure to contact their doctor or pharmacist immediately.